We love Alaskan Bush People. Allow us to tell you why. Now in its second season on Discovery, Alaskan Bush People is a documentary series that follows the unique lifestyle of the Brown family. Married couple Billy and Ami, along with their seven grown-up children Matt, Bam Bam, Bear, Gabe, Noah, Snowbird, and Rain, co-inhabit a one-room cabin that they built themselves in the Copper River Valley of Alaska. They also share their habitat with the newest and tenth member of the Brown clan; a Belgian Tervuren sheepdog named Mr. Cupcake. The Browns are bush people in every sense of the term. They rub themselves with cedar branches for cologne, devise their own ‘machines’ out of junkyard items (take for example Noah’s ingenious clothes dryer, which is essentially a rotating trashcan over an open fire), and years of isolation have seen them develop their own unique accent and dialect that has to be heard to be believed. While detractors of the show’s legitimacy dominate the title’s Google results, Alaskan Bush People nevertheless allows the viewer to feel like they’re participating in an anthropological study. Constructed or otherwise, the daily dramas that unfold in the Brown family’s isolated bush territory have previously been the stuff of folklore, and stand in refreshing contrast to what we’ve come expect from ‘reality TV’ (we’re looking at you, Real Housewives). On the other hand, Alaskan Bush People is also so much more than a dreary documentary, as we are irresistibly drawn in to the strange family’s behaviour and customs from the very first viewing, and are ironically addicted to the imaginary clean-air feeling we seem to get from gazing into our glowing TV screens. With minimal voiceovers to interfere with the verisimilitude of the experience, we feel like we’ve embarked on an invigorating camping trip without having to leave the comfort of our own homes. We remove ourselves to the Copper River Valley, where the pressures of office jobs, social media and modern technology are seemingly nonexistent, and all that remains are wholesome family values and living off the land. Alaskan Bush People is like a real life soap opera set in pioneer times, where nothing really happens, but you’d happily view the same episode on continuous repeat trying to figure out which brother is weirder/strangely hotter. And where else can you watch a couple of bush-dwellin’ siblings build a hot tub out of fire, tarpaulin and a hole in the ground, and then go for a dip in it completely dressed? 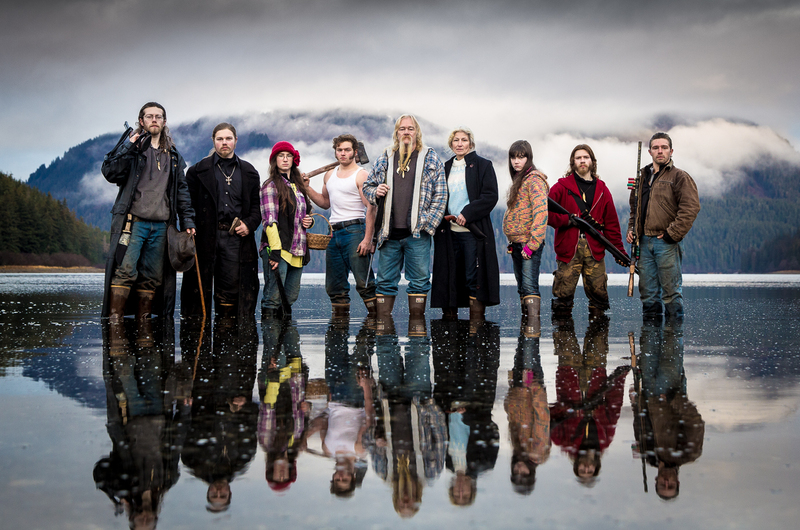 Catch up on episodes of Alaskan Bush People on NOW TV using the Entertainment Month Pass. « We FINALLY know the time for Doctor Who: Series 9!